The last day of my friend’s life, it was a blindingly bright sunny day – the kind of February first in Portland, Oregon that makes you close your eyes and smile directly into the sun. I moved a pillow and blanket to the sliding glass door so she could lie baking in the sun stream, one of her favorite places to rest. Briggs, full name Brigsby, came to me in late October, 1991. A sophomore in college, I had rented the basement of a house in Havre, Mt. with my girlfriend, Holly. In typical Montana Hi-Line fashion, it was freezing that October night so I was shocked when a small Indian boy – probably 10 or younger – knocked on the door. He was holding the mini-Briggs; a tiny black-base calico (which I now know is called tortoiseshell) with an orange spot on her forehead and half a white mustache. His parents said he could not return home until he got rid of her. So, I said I’d put up signs and the college and find her a place. But she was already home. I laid out newspaper that first night and tried to explain that it was the bathroom. But after a day, she hadn’t messed anywhere. I called a vet who explained that cats are often litter trained early by their moms and that I should get a litterbox. The second I presented her with a shoebox of litter, she jumped in and went. And that’s the kind of cat she was – didn’t make messes or damage furniture – despite being a hellcat for years. In our nearly 20 years together, Briggs and I lived in 10 different places in Montana, Idaho, Wyoming and Portland. She became a bit of a traitor in the past eight years as she became inseparable from my husband, Bob. In fact, her tired body might have given out sooner if Bob hadn’t been in a terrible accident this August and nearly lost his leg. Briggs spent every day of his recovery lying with him, or on him, as they watched every TV program worth muster. It would take a book to recount all of the memories we’ve had with this cat. But some really stick in mind. First, the name: I was very lonely my first couple years in college. I used to go to this little dive bar in Havre for the great juke box. When I decided to keep Briggs, I named her after the Beatles song often played there. I’m not sure how I didn’t notice the song is “Eleanor Rigby,” not “Brigsby,” but I didn’t. With her, I wouldn’t be lonely. The next year I found out how unique Briggs was internally. She’d gotten pregnant and for an unknown reason both kittens died. Since I wanted another kitten, I let her get pregnant again. This time, she forced me to stay in the closet with her as three kittens were born into my hands. They were all fine and adorable, until the next morning when the first-born was already dead. I freaked and took her to the vet. It turns out that Briggs was Type B blood – only common in other parts of the world – and it caused an RH Factor reaction, her blood’s antibodies attacked the kitten’s Type A when they nursed. The vet was only able to save one kitten, Frosty, who also had Type B blood. Frosty also lived a privileged life with us until she died 2 ½ years ago. Briggs was the mighty protector of Frosty and my other cats. Once, I saw her and Frosty chase the neighbor’s German shepherd out of the yard. She’d go after anything that moved if it was in her territory – birds, snakes, bats and her possible favorite, chipmunks. But mostly, Brigsby was a lover. As a kitten, she would ride around in my housecoat pocket. Throughout my life, she’d come running to comfort me every time I cried. As an old, crabby senior, she would still let Bob rock her like a baby – hold her overhead like an airplane – roll her up like a burrito – pose her for hundreds of duo self-portraits – or pretty much do anything he wanted. Although Briggs was suffering greatly these past two weeks, she would climb the stairs every night, find the step stool next to the bed, and get in to snuggle me. (I’ve forgotten to mention that Briggs has been totally blind for over a year!) She’d whimper when I got up to use the bathroom eight times a night (I’m 31 weeks pregnant), and then snuggle against my belly. Last night we let Briggs go. It was time to release her feisty brain from that failing body. It was one of the hardest things I have ever done. She’d been with me half my life. I’m going to miss her for a long, long time. Yet today, I’m going to remember my “fat cat,” who was always motivated by food and could hear a package of saltines being opened across the house … and knew what T-R-E-A-T spelled. She was my talkative girl who became such a buddy to my husband that I was jealous. It was my true fortune to have such a good friend for such a long time. Thank you for the immense joy you brought to my life. I love you forever. Once again, a morning sales training session has triggered a revelation about how I perceive success and why I am struggling to share and embrace my journey in pregnancy and starting a family. The training was on goal setting. We all named five “top performers” and discussed what their life goal may have been; how they may stay focused on goals; how they deal with adversity and failure; and how they view risk. The list of people included Obama, Lance Armstrong (and many other pro athletes), Oprah, Warren Buffet, Donald Trump, Jack Welch and even Will Smith. In less than an hour, it struck me as odd that none of us, myself included, listed a person like Mother Theresa, the Dalai Llama, Greg Mortenson or any great healers, teachers, spiritual leaders or authors. We all listed people who’s “top achievements” are defined by wealth or winning. That perception of success is why I am struggling with my biggest personal change. Growing up, I have had two major goals pushing me. First, since probably age 7, I have had a burning desire to be a famous author and speaker. Second, since my pre-teen years, I wanted to prove that I can do any job as well as, or better, than any man. I always said I wanted to support myself and I believed that a big salary would solve all problems. Now, I realize only one of these goals match my core values. I’ve had a skewed definition of success in my life. On the women’s liberation front, however, my former goal is preventing me from embracing the joys of being a woman. I’ve proved the equality point well enough by excelling in academics, working hard labor jobs, carving a niche (and big income) in the male-dominated finance field and competing athletically alongside men. It’s time to put that goal on a shelf like a tacky trophy that collects dust. I need to embrace the fact that I need my husband’s support and protection. Not that I can’t stand on my own – but that I don’t have to anymore. At five-and-a-half months pregnant, I need to stop hiding the truth and joy from my professional circle. I must stop thinking I will either fail at being successful professionally or at parenting. The only way I can begin to reconcile my desire to nurture and my passion to excel professionally is to face the truth. I can’t blame this conflict on hormones. I’ve had less respect and admiration for terrific moms, housewives who sacrificed careers for the family and spiritual people who live by faith than those “top performers” with millions and athletic triumphs. I’ve forgotten the poorly-paid teachers who noticed in that I excelled at writing and encouraged me. Since I can visualize being a great mother and wife AND being successful professionally, I shouldn’t be ashamed of being on both paths simultaneously. If goal setting begins with figuring out “what you want,” then I need to accept that deep down, I have always wanted it all – to excel in every role. Only “how” I will get what I want and “when” I will get it is uncertain … and out of my control anyway. An imaginary invention just might keep me sane through this pregnancy: a pregnancy filter. I’m not imaging a filter that would keep three or four glasses of wine from reaching my baby, although that sounds okay. What I really need is a filter that sorts the comments and stories people are so quick to share about pregnancy, childbirth and life to follow. This filter will deflect the comments about how my life will never be the same, how much work children are and how I will be tired for the rest of my life. True or not, these comments are destructive on days when my hormones already help me blow everything out of proportion. My pregnancy filter would strain these comments like water or air through a sieve. It would catch the stories of joy, love and adventure that other parents share about having children and let them roll around like sparkly beads. While I’m inventing, the filter might as well be programmed with a setting that will clear thoughts of uncertainty or fears from my mind. I picture a little zapping mechanism that fries those thoughts like pesky bugs on a summer night. A little lightning bolt and no more worries about the future or my abilities as a mom. Zzzt. Gone. Irritation that my workouts lack pep – zzzt. Longing for a waistline – zzzt. Jealousy when everyone else knocks back their third beer – zzzt. Panic that my window on personal time is closing – zzzt. Sadness for no seemingly good reason at all – zzzzzzzzzt. Now my mind can be full of wonder and excitement for all of the great things in our lives and on our horizon. I can bask in appreciation for the many blessings I have. I can smile about the little fingers and toes. I can feel my sweetie’s hug like a fuzzy warm sweater around me. Armed and protected with this imaginary shield, I can respond to the stories of horror and exhaustion with a blank look. I’ll let the not-so-helpful comments slip right through the filter or get zapped into an imaginary faint puff of smoke rising from my head. Then I can concentrate on what really matters: finding happiness in change. Change is the only constant: The irony of being pregnant. On one hand, everything changes and will keep changing – lifestyle, body size, priorities, etc. Yet on the other hand, nothing changes – day-to-day life, basic needs and the importance of the positive mindset. Some days I wonder why everyone else seems more excited about this big event than I am. I suspect it is because most of them have children and have a keen sense of the joy and love that I cannot yet imagine. Those days of mixed emotions are offset by the visits to the doctor for ultrasounds, which are thrilling and confounding. The human body has always amazed me. Seeing another tiny human body form from a spec is … well, miraculous. For the past five months I’ve referred to the baby as the spec, the Brazil nut and the lime (because books use these objects to explain the baby’s size.) I’ve called it the baby, it, he, she and an alien. But now, she is a little person with active arms (like mom, talks with the hands), fingers, toes, growing internal organs (we saw the brain, bladder, kidneys, stomach and pumping heart) and a gorgeous little face that is either talking, singing or looking for food (again, like her mother). And suddenly everything revolves around her. I feel more protective knowing she is a girl. I feel a bit of pressure to instill in her an unconditional self-love. Picking a name that expresses how smart, creative, unique and intuitive she will be is beyond daunting. As if that’s not enough pressure, I am still trying to figure out how to work my own business, make adequate money and align to my true passions. I guess I would be going through that process pregnant or not. Knowing she’s coming just makes the balance much more important. To everyone who keeps asking how I’m doing, how it’s going and if we are going to have more than one … here are the answers. 3) Let’s get through the first one first. 1) I am doing the best I can on a daily basis. Before I was pregnant, I was very hard on myself, impatient and sometimes a bit crazy. I am still all of those things. I’m constantly working to have a heart full of love and a positive mind. My whole life, I said I would never do this without my perfect match beside me, and I am so glad that he is. Bob is my rock. Earlier this week, a friend posted this Zen proverb: Let Go, or Be Dragged. I like to act like the world revolves around me, but every time I play God – even in the slightest bit – I am quickly reminded of my true place (little spec next to ant). I’ve long been a gardening enthusiast. In the past decade I’ve focused on organic, natural ways to create and to kill. Although I really wanted to poison the mole that put 34 holes in our yard in a month last summer, I bought a vibrating underground stick instead. When I saw the ladybug guy at the farmer’s market Saturday, I decided it was time to play God just a little. 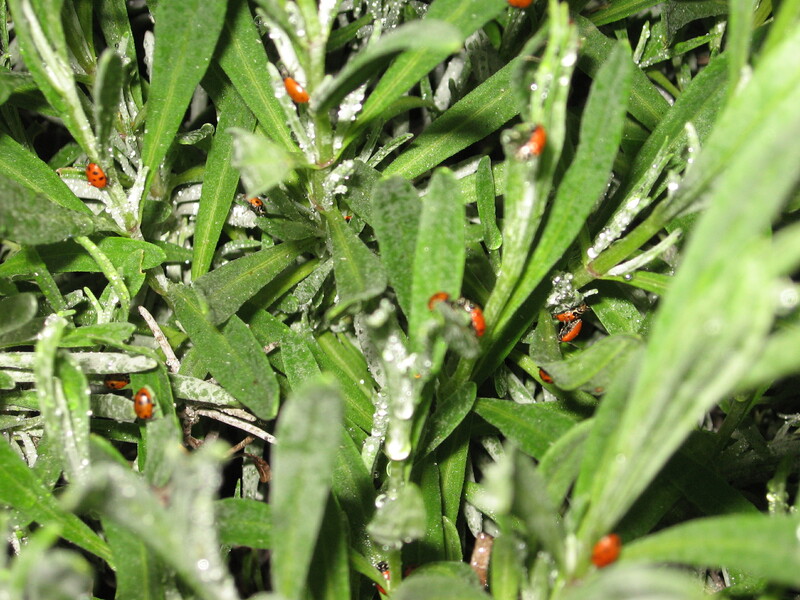 Ladybugs feed on annoying little critters like the whiteflies and aphids that came home with me on a couple geranium starts. 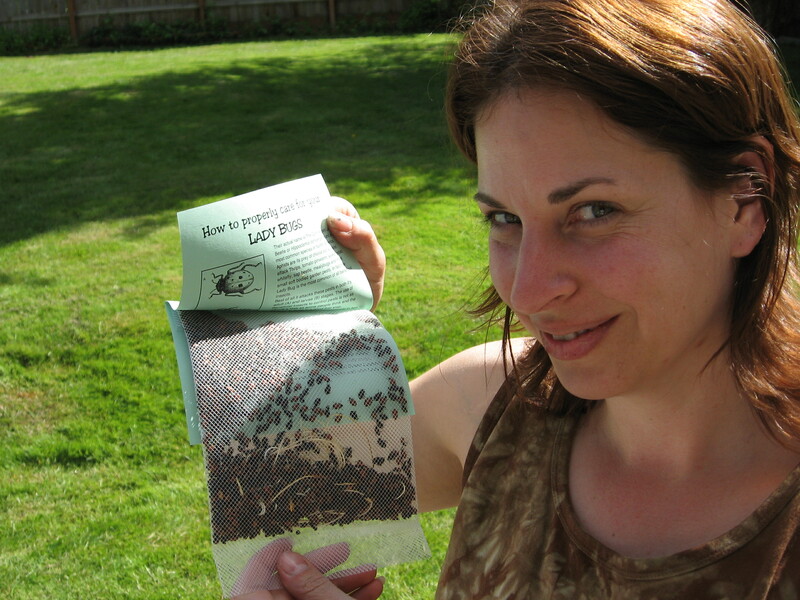 We read the instructions and waited until dusk as ladybugs apparently don’t fly away at night. The directions also said you can spray the ladybugs with a 50/50 mixture of pop and water so their little wings get sticky and they can’t fly away for a few days. Since we don’t drink sugar pop, we thought a sugar-water solution would do the trick. Bob found a spray bottle, cleaned it and made a solution. I released them throughout the yard and garden, asking them to bring luck and prosperity to our crop. Sunday morning I bounced out into the sun to check on my little ladies only to find that most of them were dead. Of 1,500 ladybugs I’d killed all but 100 or less. My little “God” experiment failed miserably. Maybe the spray bottle had been used for soap, although we thought it was thoroughly cleaned. Perhaps it was just too much sugar in the water and we candied their little breathing apparatuses. Regardless of the reason they died, I felt a complete failure. Now, I cannot stand an unanswered question so I went to the Sunday farmers market and found the ladybug man and asked him if it’s possible to kill them with sugar. Turns out it is possible. Too much chlorine in the water can kill them too. Despite the previous day’s tragedy, the ladybug guy kindly gave me a fresh bag of 1,500 bugs – and he advised me not to spray them at all. So, I did my part and let them go. I don’t think they all survived for whatever reason, but I see hundreds crawling around looking for little pests to chomp. I don’t feel so badly about the dead ones, partially because I can’t tell if they were from the first batch or the second, and partially because I understand that like most things, it is out of my control. I just need to chill, and let my Father do his job. I am a Facebook fan of not being a fan of anything I’m not really a fan of. In other words, I am not a good liar in person or on screen. If you con me into joining your page to win a great prize – a trend so prevalent I see hundreds a week – I am going to un-fan as soon as you give the car, greenhouse, money or other prize to someone else. Many of my Facebook friends and in-laws send invites to join pages, groups and causes of products and services in which I have no experience. Possibly I will like your product, but I have to at least see it (taste it, wear it, try it) first to decide. I’m really wondering how we close the gap between true fans of our businesses, groups and statements and the people who just click on everything. Am I rude when I don’t join your kids’ fundraiser group or become a fan of some business across the country I will never use? As a true fan of studying marketing approaches and how well they work, however, I wonder if businesses see more value in 40 real fans or 400 fans. While writing this, I got this link from a social media guru http://ow.ly/1Asnj. Thank you so much Robert. I suspect if I read a couple more of your blogs – I will be a fan! I’m not planning to un-friend anyone for repeatedly pushing me to fan up. Just understand when I hit “ignore,” that’s me being polite. I’d like to hear why people join groups and become fans, and if they are honestly fans. A couple months ago I had blog requests from two of my biggest fans (not including my mom). One asked for a photo blog and the other requested a “fun and not-so-serious” blog. Stumped, I did neither. Since I haven’t written here in over a month, I thought I’d honor both requests and share my favorite personal mystery. 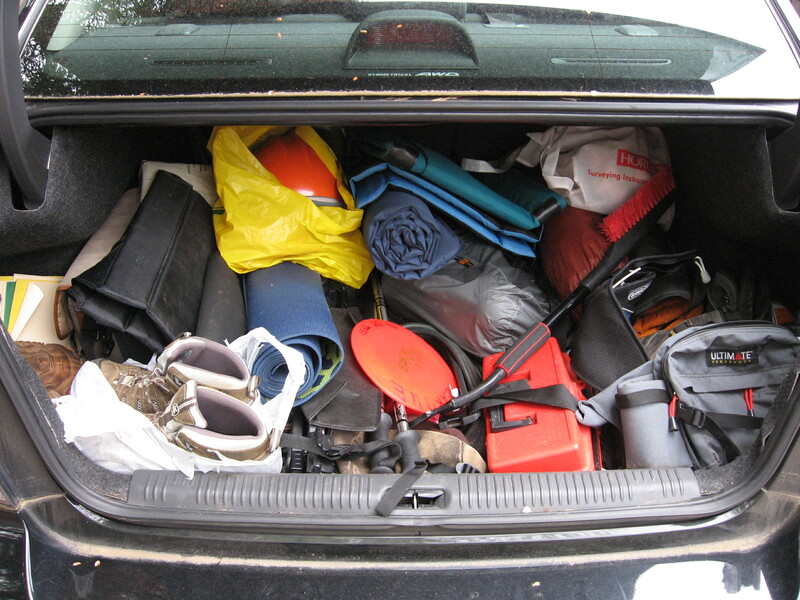 This is an expose on what my hiking partner recently tabbed my “trunk of amazement.” The junk in my truck suggests I may run away shortly or I like to be prepared. Since most of this gear has been riding around in my Subaru for years, I am probably not going to r-u-nn-o-f-t.
~ (3) Crazy Creek chairs – must use for next roller derby! 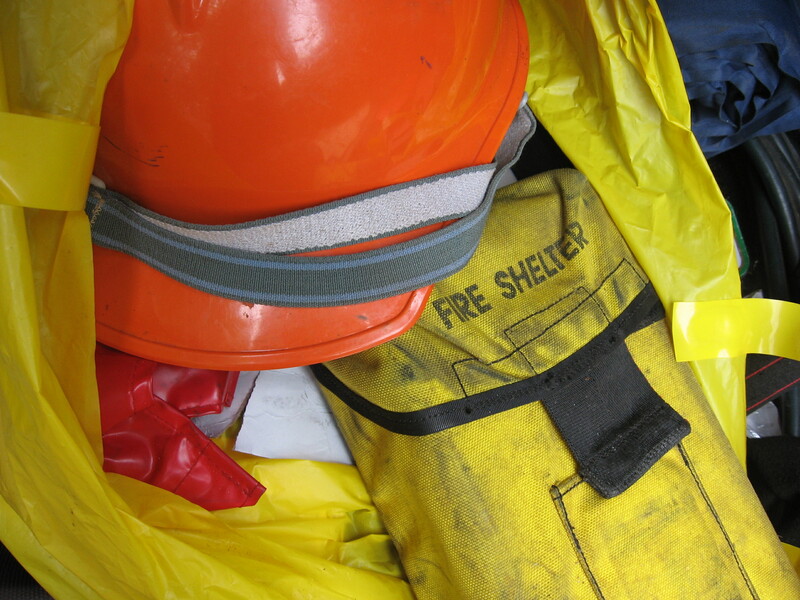 ~ Fire shelter and hard hat – in case I drive upon a wildfire? Everyone is talking about Hoarders and A&E. I’ll admit that I begin every show by saying I won’t be able to watch the whole thing, and then I’m mesmerized to the end. While some people watch and admit that they have tendencies to collect unneeded crap, I am quite the opposite. I find myself peering around the house for any areas that might be victim to pileup. With the exception of one organized – yet stuffed – closet, my house is very tidy. 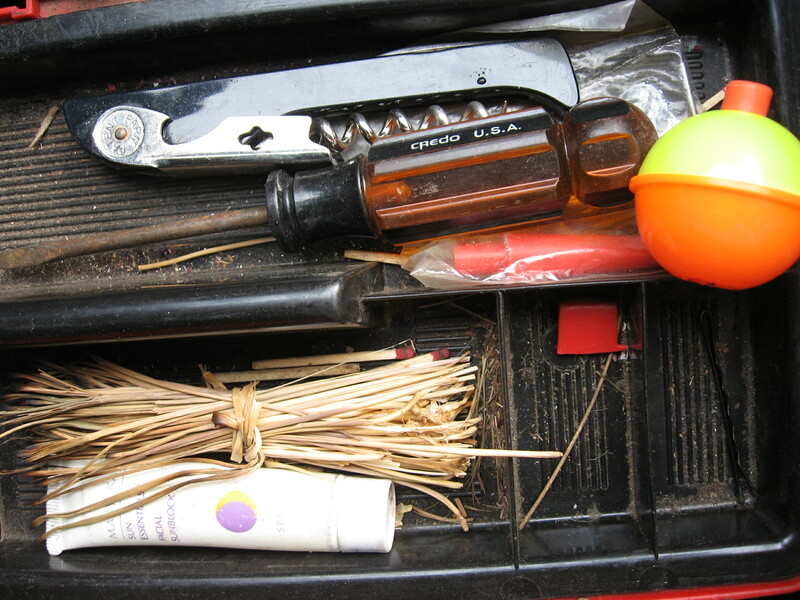 I used to be a clutter bug, if not a hoarder in training. I had a small apartment with dozens of houseplants and prized possessions hanging everywhere. I wouldn’t clean for a few weeks and then I’d freak out and deep clean everywhere. Most of the items that cluttered my space were valuable and/or memorable. When I decided to quit my old life and go west for a new one (yes on the Oregon Trail), I had to downsize. Knickknacks, collectible plates, clothes and almost every piece of furniture had to go. I wanted to sell valuable collectibles, but there was no marketplace. So, I had a free garage sale and forced all visitors to leave the house with something. 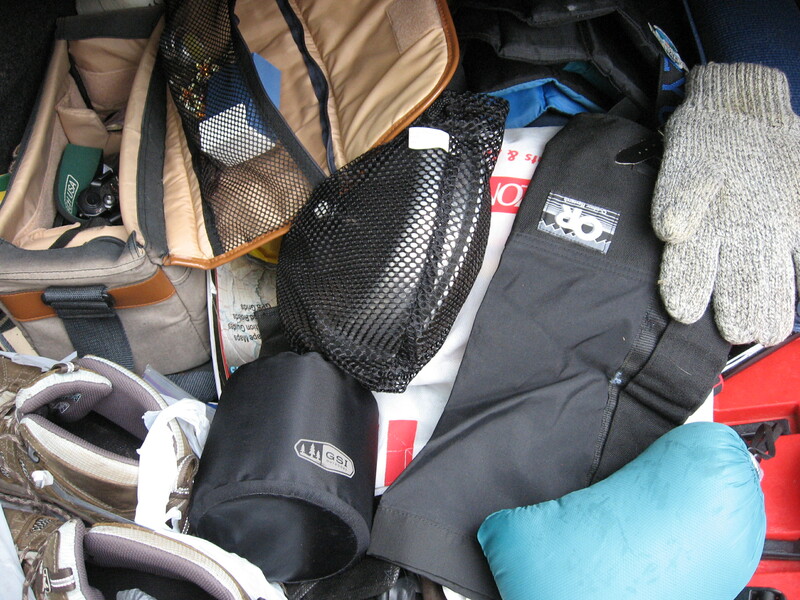 Hoarders have emotional reasons for filing their homes with stuff. I found emotional release in giving stuff away. I was holding onto boots that climbed summits yet killed my feet, gifts from old boyfriends I hate and even the leg cast I wore in torment after destroying my ankle. I let go and old emotions stopped strangling me. Our first apartment in Portland was so small that we emptied half the moving truck at Goodwill. (I do regret ditching the snow shovel.) The bed was our only furniture, yet we felt free. 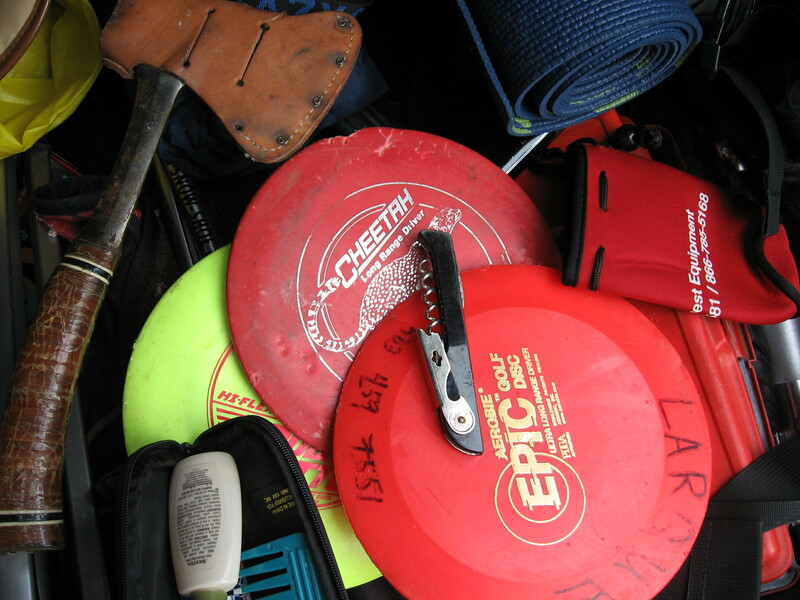 In the six years since, I’ve tried to only keep sentimental, valuable or useful items. 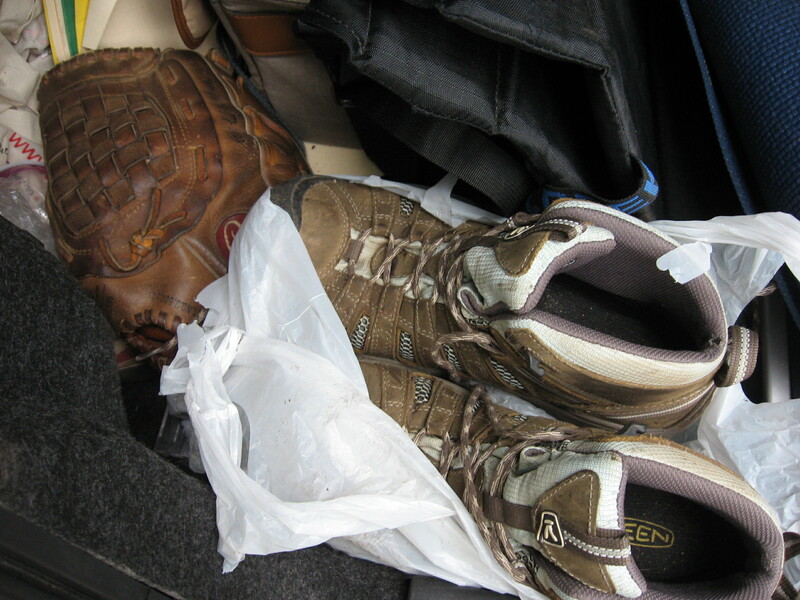 Clearing clutter seems to open my life to change and release negative emotions. The day I was laid off, I sorted the entire garage. I recycled boxes of school papers my parents dropped off when we bought the house. The next day I attacked the crammed walk-in closet. I’ve gone through both again since, getting rid of more. If there’s a medical condition that makes one consider packing a backpack and walking away from all other belongings, I am prone to it. I’d rather have very little than a house full of junk and filth. Likewise, if I see a chance to shed emotional baggage and make room for growth, I will. I don’t want my head and heart full of junk either. In high school I gave up material things I loved, like chocolate or sweets altogether. One year I attempted to give up swearing. Every time I swore, I would do ten pushups or sit-ups. By the end of Lent I had great abs and arms. Learning about Catholicism during nine months of required adult education provided a better insight to Lent and what it means to me. Personal changes can be made in any season, regardless of religion. However, Lent prompts me to look at myself honestly and the changes I need most. Instead, I will continue to attack serious downfalls in my spirit and attitude – the areas in which I do not behave like Christ (or Buddha or any enlightened being). I’ve learned that you’re not supposed to announce your Lenten plans, so I’ll talk about past years instead. Two years ago, I gave up complaining. Yes, complaining. I can’t say that for 40 days I never thought or voiced a complaint. Who could? But I learned to catch complaints in thought, ask myself what good the complaints served, and then keep most of them to myself. It’s amazing how many complaints our heads come up with in one day. I get out of bed and complain that my back hurts. Then I complain that the cat puked on the floor. The shower runs out of hot water mid leg shaving and I complain again. Plus, there’s always dishes in the sink, traffic is bad, and on and on. I caught myself complaining about good things like a messy fridge filled with too much food. Or the sun was too bright. Or there was too much work to do (who would have known I would loose my job). I needed an attitude adjustment and it started with being aware. Why was I complaining? How could I be grateful instead? How much of this could I just turn over to source and let go? It turns out that most complaints are not warranted and serve no good purpose. I still complain, but a lot less. Even my husband notices the difference and catches me if I start complaining. This year, I’m tackling a pretty huge lineup of issues. If I have success, I will find peace and joy in every day. For anyone who wants to keep chocolate and give up something hurtful, this little reflection is from one of our church bulletins last year. I cut it out and it’s still on the fridge. Give up complaining … focus on gratitude. Give up pessimism … become an optimist. Give up harsh judgments … think kindly thoughts. Give up worry … trust Divine Providence. Give up discouragement … be full of hope. Give up bitterness … turn to forgiveness. Give up hatred … return good for evil. Give up negativism … be positive. Give up anger … be more patient. Give up gloom … enjoy the beauty that is all around. Give up jealous … pray for trust. Give up sin … turn to virtue. Give up giving up … hang in there. I don’t know why I took a break from blogging. Let’s just call it laziness. (A bad habit is as easily set as a good one). Some readers missed my writing, but I realized yesterday I am the one suffering. Blogging keeps me in the habit of writing, which is good. Plus, rewriting and editing each blog hones my wordsmith skills. More importantly, writing helps me think creatively and explore unexpected thoughts. Analyzing my thoughts helps me distinguish between fact and fiction. Often, I create a truth in my head that is upsetting and detrimental to my goals and relationships. Those negative thoughts roll around in my noggin. Like a snowball, they get larger with every roll. Pretty soon, the thought is a horned monster that stabs at my confidence and enthusiasm. He gnashes his terrible teeth and roars his terrible roar just like the characters in my favorite book. Then, I put him on paper (or screen). When I dissect the monster, I see it is either a tiny, baby monster or no monster at all. Either way, it is no match for facts. So, I need to get those pessimistic thoughts out quickly so they cannot build momentum. I know some people write their fears and concerns and then burn the paper – or freeze it in blue water. In some exercises you write the worst possible scenario imaginable (in regards to that fear or worry) only to find it ridiculous or comical. Some people journal or write letters they’ll never send just to work out their thoughts. His work focuses on feeding the subconscious creative thoughts – and mine must too. An avid gardener, I know my love and passion for the crops is unequaled. Sure, people enjoy my tomatoes – and my blogs – but the genuine nourishment is mine. So I’ll strive to tend the garden more often and rid it of weed sprouts and imaginary monsters.